Any business can be nimble. It starts with true leadership. We often hear about pivots and pivoting in the context of quick shifts by an individual or in the early days of a startup. A quick “turn on a dime” pivot does not result in lasting change for a business beyond a handful of employees. Perhaps the mental model that a pivot must be quick has stopped you from considering it for your business. Consider The Pivot. The Pivot leverages one of the most effective means for long-term change: collaboration. It inspires action in terms of best next steps. 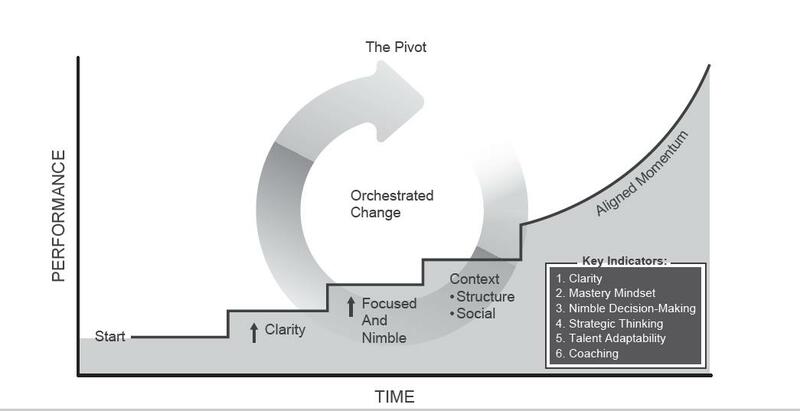 The Pivot, as termed in the book The Pivot: Orchestrating Extraordinary Business Momentum is a well-orchestrated change over time, comprised of smaller changes or shifts initiated by many people (individually or in small teams). Mastering The Pivot is critical to extraordinary business momentum – aka, Aligned Momentum – and makes performance breakthroughs possible. You can begin your Pivot toward a culture with Aligned Momentum with just one decision: to practice true leadership. > You agree to prioritize building up others so that everyone grows and succeeds. > To do so, you commit to creating the tone for an organization where every person knows that their manager (or similar) wants them to be successful. > You will take steps toward getting clearer and being more clear in your communication. > You will dispense with any desire to be a hero in your leadership role. > You will take steps to ensure that positive influence trumps authority-based power and you will be a model of this in action. > Finally, you agree to participate fully in any Pivots that involve you and to orchestrate the changes that employees will initiate naturally as you build Aligned Momentum into your culture. Previous PostPrevious Aim to be a Great Leader? Don’t be a Hero. Next PostNext As a leader you can’t change a person but you can change their context.